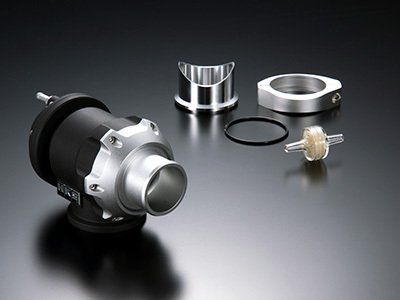 HKS original 3-chamber structure ensures the stable operation of blow-off valve regardless of the amount of pressure. Large 51mm valve performs great with high power and large displacement engines. Adjustable pre-load allows a wide range of application. Typical blow off valves require spring load settings for each vehicle specification. If the spring load setting is too low, the boost pressure may be relieved under high boost, and the desired boost setting may not be reached. If the spring load setting is too strong, the valve may not open at low boost. 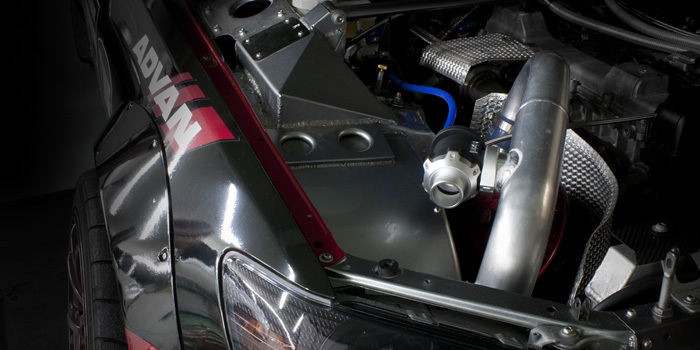 HKS RACING SQV utilizes a reliefless type; therefore, it delivers stable operation at all boost levels. Durability tests of over 1 million operations minimizes the chances of valve stick and achieves high durability. HKS’ original 3-chamber structure ensures the stable operation regardless of the amount of boost pressure. 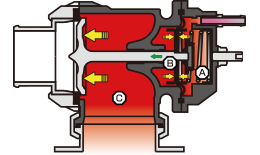 As pressure rises in chamber C, pressure is applied to a single valve. 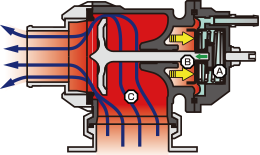 The higher the boost pressure, the more pressure is applied to the valve, preventing leaks. Throttle lift creates a pressure dierence between chambers A&B, opening the single valve. This creates the large air volume discharge. 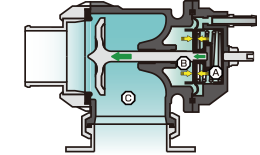 The differential pressure in chamber A & B is eliminated as time elapses, and a spring reaction force closes the valve.